Ok, my daughter is a bit of a hippy. She loves peace signs and tie dye. I thought it would be fun to make her a quilt made out of different 6" blocks representing peace and balance. Little did I know that it's hard to find free quilting patterns for that type of thing. So I broke down and made my own. 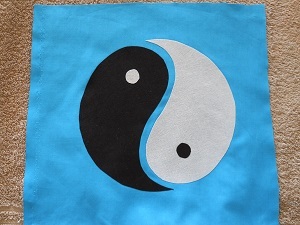 I made this yin yang design by tracing some free clip art and creating an applique. It turned out pretty well don't you think? I like the feel of the black and white on top of the blue. It creates that feel of earth and ocean. I didn't originally intend to do that, but it works. I'm looking forward to finishing the quilt with blocks of different appliques. I can't wait to see her face when she gets it. This is going to be a 3 block by 3 block (total of 9 blocks) wall hanging for her room. The only thing I'm having a bit of trouble with is what should the other blocks be? I'm already doing one with a piece sign, but I need at least 7 more blocks to finish it out. I don't really want to repeat a design. Can anyone help me with more ideas? I want to keep with the theme. Thanks everyone. Your help is greatly appreciated! Great appliqué! I came across a double happiness quilt block that you might consider. please show us your quilt when finished... Better yet, show us your blocks as you go. I love your color choices! Very nice! http://www.nydailynews.com/life-styl....950858?pgno=1 – you could do each child in a different tie-dye shirt! I agree with Nanny -- show us your blocks as you go! Good Luck! two fingers making a v from the WWII symbol that was later adopted by the hippies. did you want some pieced blocks as well as applique? Your Ying Yang is great!!!!! Jan in VA mentioned a VW or VW bus and I think either or both of those is a great idea. Maybe put a flower design on the door or just use big flower fabric? I know there are quilt patterns out there for both those vehicles so maybe you even could look at them and design your own. This should be a fun quilt to make! maybe a great big tree in the middle of the quilt blocks. sort of like a great big tree of life. I would also suggest batiks. they seems that they are something hippie ish. at least to me. I would go with maybe more idea than steriotype. I knew a few types that would be called a hippie but they wouldn't be pleased to be styreo typed as the "hippie" most think of. go with her person ality and things she would have in her home. I will! I've got excellent ideas going on now. I especially like the sun/moon idea and flower power. Thank you cherisews and Jan. Excellent ideas. That gives me a lot to work with. I love the Tree of Life idea. I'm thinking I might include the green man in that. My daughter is pretty proud to be called a hippy. We embrace it at the same time as her Marine grandfather. I really like the tree of life idea and I definitely think that batiks should be used throughout. They have more of that tie dye feel to them. I would like to thank everyone for the wonderful ideas. I already have a block made of this cool butterfly. I'll try to get a picture of it up soon and put it in this thread. I also thought of snail trails because of the circular pattern similar to Yin and Yang. I can't wait to see all the blocks. 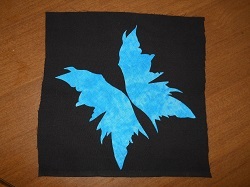 Here's the butterfly block that I'm going to add to the quilt. 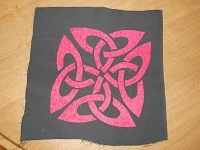 I was also thinking of adding this celtic knot block to it too. It kind of adds the infinity symbol to it. But I'm not sure if it would work well. Love your ying yang. How about a pair of bellbottoms with a wide belt. 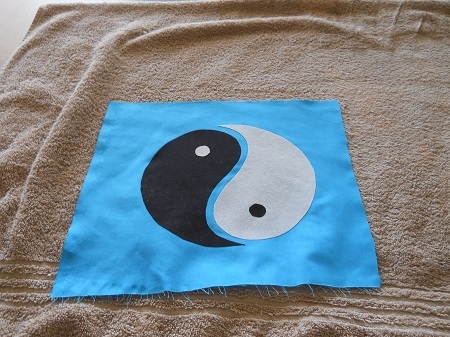 You did indeed come up with a good pattern for a yin yang block. It was always a favorite of my daughter and her best friend, but I didn't make any quilts with that pattern. Something to think about. Don't forget that ever popular Smiley Face!